Learn Spanish in Spain’s fascinating capital! A city full of life and energy, Madrid is the perfect destination in which to learn Spanish, where its people are known for their open and friendly nature. If you choose to study Spanish at one of our two schools in Madrid you will get to know this city´s unique balance of rich history and culture on the one hand and its entirely modern, cosmopolitan and business-like feel on the other. Madrid offers so many things, whether your passion lies with leisure, culture, fine-dining, nightlife, shopping, or all of these! Look out for “Arco,” Europe´s largest modern art fair, which turns Madrid into the centre of the international art world for 5 days each year. Madrid is also the political centre of Spain, a business centre, the residence of the Spanish monarch, seat of government and Spanish Parliament and hence the atmosphere is always vibrant and dynamic at any time of the year. Our school in Madrid is very centrally located within just a few minutes’ walk of Plaza de Espanya and the University, in the attractive downtown neighbourhood of “Argüelles”. The area boasts a huge choice of bars, restaurants and shops and is therefore very popular with locals, visitors, students and tourists, for dining out and going out. The school is extremely well connected to the rest of the city with two metro stops, Argüelles and San Bernardo, close by. There are also several bus lines passing on adjacent streets, which can take you to any other part of the city. Our school is situated on two floors of a renovated building and has an extensive outdoor patio. 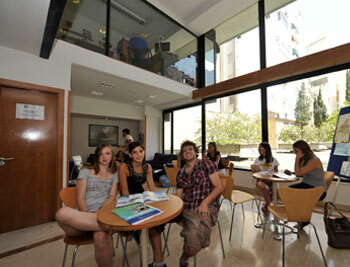 There are 40 well-equipped classrooms with audiovisual learning materials and plenty of natural light. There is also a library with Spanish language DVDs and a computer room with free internet access. You can catch up with your friends and purchase refreshments in your breaks between lessons in the school´s large common room. There is WiFi free of charge, as well as air conditioning and heating throughout the whole school building, ensuring that your learning environment remains comfortable at any time of the year! Our Madrid (Plaza de Espana) school offers a wide range of Spanish courses, to suit all preferences and interests! You can choose an Intensive course of 20, or a Super-Intensive course of 25 or 30 lessons each week, depending on the amount of time you wish to spend in class. Our Super-Intensive course of 25 lessons includes the Intensive group course plus 5 conversation lessons each week, and the Super-Intensive course of 30 includes an additional daily private lesson. Any of the above Intensive courses at our school in Madrid are a fantastic choice if you are looking to improve your overall level of Spanish and learn with like-minded peers of a similar level to yourself. Alternatively, if you wish to tailor your course to meet specific requirements, you can choose to take Private Spanish lessons, or to combine group and private tuition. These options are also available at all levels of Spanish and for as many weeks as you wish. If you wish to study with a friend who has the same language level as you do, then our school in Madrid offers Duo Spanish courses as well, where 2 students study in the same class with 1 teacher. Our school also offers a DELE Exam Preparation course for a period of 2 or 4 weeks, designed to prepare you to pass any of the 6 levels of the DELE Examination and a Business Spanish course sponsored by the Spanish Chamber of Commerce! Please contact us for further information and start dates! For students with an intermediate level of Spanish, our school offers a Spanish & Work Experience course, where you will attend 4 weeks of 20 general Spanish lessons per week, followed by an unpaid work placement position in a local company or business. On the basis of your preferences, our school provides the assessment, orientation, training, placement and support for all students attending this programme. If you are interested in learning to dance, then you can even opt for the special Spanish and Flamenco course! This course includes 4 Spanish classes plus 2 dance lessons each day. 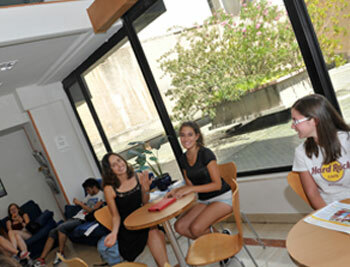 Whatever your preferences, we believe there will be a Spanish course that is perfect for you! If you wish to totally immerse yourself in the Spanish language and culture during your stay in Madrid, then we would always advise you to consider staying with a carefully selected Spanish host family. This provides the very best chance for you to practise your Spanish with native speakers on an everyday basis, to share home cooked food at mealtimes and to gain insight into daily life in Spain. Our school in Madrid will always try to accommodate students within just 20-30 minutes distance from the school building, either on foot, or by public transport. In case you have any special dietary requirements, allergies or other special requests please just let us know at the time of your booking and we will do all we can to match your requirements. Alternatively, if you wish to socialise with your fellow students and meet people from all across the globe, choose to stay in the school’s student residence. Stay in single or shared rooms and choose between bed and breakfast, half-board or full-board options. Finally, you could opt to stay in one of the school’s shared apartments, which is an ideal choice if you like your independence, but still want the chance to meet other people! As you can perhaps imagine, in the capital city of Spain there are endless free-time possibilities, sight-seeing opportunities and attractions! 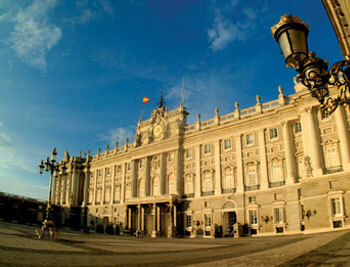 You are likely to fill all of your spare time in Madrid very quickly, with all that the city has to offer. Our school in Madrid offers an extensive and exciting cultural programme to help you to get to know the city and to improve your spoken Spanish outside of the classroom, in real-life situations! 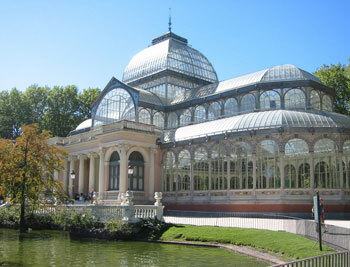 Examples of typical activities available include walking tours around the city (Modern Madrid, Hapsburg Madrid and Bourbon Madrid), visits to museums and art galleries (Prado, Reina Sofia, Sorrolla Museum), a ride along the river Manzanares, cinema evenings and guided tours of the parks and gardens (Retiro Park, Royal Palace Gardens), to name just a few! You can also sign up for weekend excursions to other towns and cities of interest, such as: Toledo, Alacala de Henares and Segovia. You can fly to Madrid Barajas International Airport, which lies just 16km from the city centre. There are both metro and bus services to the city from the airport terminals 1, 2, 3 and 4. Or, you can take a taxi from the airport to your accommodation instead. 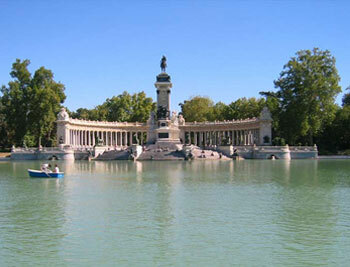 There are train and bus routes to Madrid from many other Spanish and European towns and cities. The main train station (Atocha Station) is easily accessible by metro from and to the city centre. At the time of your booking you may wish to select a pick-up and/or return service from Madrid airport, train or central bus station and the school staff will meet you on your arrival and take you directly to your accommodation. Average score for our school in Madrid (Plaza de Espana) based on 32 previous client reviews. Very strong teachers combined with good methods and exercises. I was happy that 98% of the instruction was in Spanish. Very nice & clean accommodation and the food was very good. The staff were exceptionally friendly. Despite the lessons being so long I was not bored at all and it was amazing being surrounded by so many different people from around the world. The teachers tought with such enthusiasm and were very engaging. All in all it was a new different but amazing experience which I thoroughly enjoyed. The course was very good. I enjoyed the course and learnt a lot of new vocabulary. I hope this will help me with my A level in June. I also learnt a great deal about the Spanish culture which was very interesting. I wish I could have had longer on the course. The teachers were both helpful and constructive. I felt that I learnt a lot in the short time that I was there. A good mix of students from all ages and cultures. The hostess was very pleasant and the accommodation was comfortable and clean. The Spanish I learnt there was as useful as the school. The course itself was very good. I enjoyed the manner in which the lessons were though and the exercises. And the teachers were very good. The teachers were great, I was placed in a good level for me, challenging but not overwhelming. The course was really quite superb. It was a very well structured course and I enjoyed every minute of it It helped me to grasp some parts of Spanish grammar that had well and truly baffled me before then! I was given a very warm welcome by the family I spent the week with. They were very accommodating and a pleasure to live with. They gave me an excellent insight into the typical Spanish family's lifestyle. Full marks! I would recommend this course to anyone who feels that they need to improve their Spanish at all. The course and teachers were all good, I feel I did learn a lot. The teaching was very good and the methodology was first class, as were the materials. Overall, a nice experience. Thought the course was very good and the teachers were also excellent. The cultural classes were also interesting. My accommodation was excellent, the location literally could not have been any better and the meals were also great. The course was challenging and helpful, my accommodation was clean and host was great. Excellent course really helful friendly staff. The school was situated in a really pleasant central area of Madrid. We really could not fault any aspect of it. I enjoyed the atmosphere and the professors were really great! I would like to take more courses in the future! The fact that we are devided in groups of levels is definetely a plus, we are around 8 per classes which is good because you can really get to talk. Most of all, the teachers are great, very patient and friendly . I definetely made a lot of progress with my Spanish. My accommodation was very clean and the host family was very nice. What struck me was the general relaxed atmosphere that removed any nervousness about attempting to speak in a foreign language. My confidence has increased and I had great fun mixing with a wide range of people. The course was great, the teachers were very patient and friendly, and I thoroughly enjoyed it. After just one week I can say a few things in Spanish and understand a bit about the language. A very enjoyable & useful experience. It was brilliant! The level was high which made me come on a lot! We covered all sorts of interesting topics and the atmosphere in the class was great! I also did a flamenco course which was amazing! The teaching was very helpful and enabled me to understand in greater depth the Spanish language. Class discussions were always interesting and developed my knowledge of the culture. The food was excellent and the host family were friendly and showed me round the city which helped me to get round by myself later in the week. I would thoroughly recommend the school to anyone as I thought the teaching was innovative and combining it with flamenco in the evening gave me the perfect opportunity to practise what I had learnt in a totally Spanish speaking environment whilst learning yet another skill. I really enjoyed everything about my course. I have learnt an incredible amount and every day was fun! I progressed at just the right speed through the course and we did fun tasks and games to make us learn even more! We even went out for dinner with our teacher as she was just like a friend with us! The host I stayed with was absolutely fantastic, she treated me just like a daughter and would spend time talking to me and she definitely made me feel welcome!